Pit Bulls are not human aggressive. The American Pit Bull Terrier as a breed is not human aggressive. In fact, quite the opposite is true of the breed. They are gentle and affectionate dogs. Indeed, they were bred to love human beings and it shows. Pit Bulls have great temperaments! Pit Bulls (American Pit Bull Terriers) score an 87.4% passing rate (as of April 2016) with the American Temperament Test Society. These temperament tests consist of putting a dog through a series of unexpected situations, some involving strangers. Any signs of unprovoked aggression or panic in these situations result in failure of the test. The achievement of Pit Bulls in this study disproves that they are inherently aggressive to people. View the ATTS stats here. Pit Bulls can be great with kids. Pit Bulls in general are gentle, patient dogs. With proper socialization and careful monitoring, Pit Bulls make great family dogs. 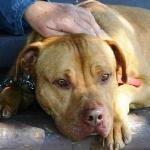 Pit Bulls are commonly used as therapy dogs. Whether they are visiting a senior care facility or helping someone recover from an emotional accident, Pit Bulls are making a mark as outstanding therapy dogs. A great resource to learn about Pit Bulls is BAD RAP. Not only are they the experts on Pit Bulls, they also offer training for FREE for Pit Bull-type dogs adopted from Berkeley Animal Services! 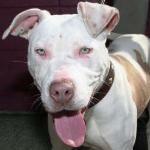 A great resource site for Pit Bull education and information is at: Pit Bull Rescue Central. The shelters are full of pit bulls and pit bull mixes due to irresponsible backyard breeding and lack of training. These dogs deserve a better life. 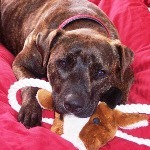 Educate yourself about the breed and consider welcoming a rescue dog into your home. 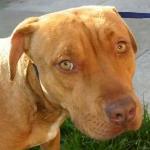 Home At Last has had many successful adoptions of pit bulls.